First off, I am a former student at South Puget Sound Community College, and now a member of the staff. 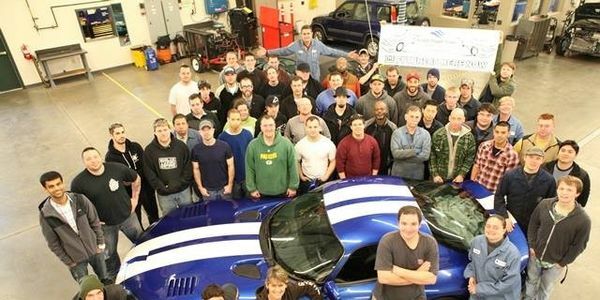 I am making this petition in an effort to save some rare Dodge Vipers that were donated for educational purposes to help students in automotive training programs to train for their future by the Chrysler Corporation. Fiat-Chryslers claim is that the 1992 prototypes no longer have any educational value, amidst rumors of misdeeds by those in possession of some of these non street legal vehicles, Fiat/Chrysler is ordering that the remaining RARE DODGE VIPERS BE DESTROYED. I feel that the college shouldn't be punished because of another educational institutions lapse in judgment. These Vipers are not just cars; they are the pride and joy of student and instructor alike. The Viper at South Puget Sound Community College is our prize jewel, and an inspiration. This and all the other Vipers are worth more than any new Dodge Charger or Chrysler 300 and most other new models. But dollar value is not it, not for us. This Viper has a dollar amount on it sure, One speaking to its immense value as a marketing tool for our program, when we recruit new and future students from high schools and middle schools. The real value in the vehicle for us though, is being so near, and able to revel in the monstrously vivacious beauty of what has been for most young men and women, a dream car. These dreams for some are now memories of posters, TV, advertisement, and in rare cases drive byes, for us, it’s tangible, real, and hard to part with if they’re just going to crush it. The students and staff spend a lot of time loving on and caring for this car just so that sounds, operates and looks as good as it can. You see, we like to admire it a bit. So help us save it, sign the petition. Let us all show Fiat-Chrysler that these Vipers still have value, Educational and otherwise. Got more updates that the Jay Leno wasn't true,but that doesn't mean these Vipers aren't worth saving. As you all read one of the many articles on how Cruel Fiat/Chrysler responded. That they didn't hear anything about the accident the 2 run away did and said we want them crushed because with everything being up to date it has no purpose or help with education. I am sorry it has more educational tools than anything HISTORY.